With the holidays coming up, everyone needs a good punch recipe for their next party or gathering. 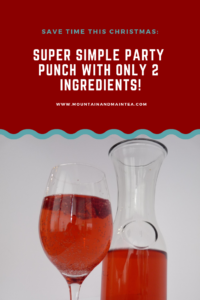 Try our super-easy, kid-friendly, gorgeous Party Punch Tea! 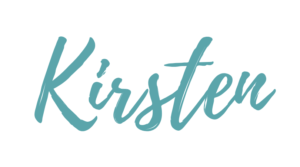 I first tried this tea served in unglamorous No-Name brand GingerAle bottles at a little potluck with friends shortly after college. It didn’t take the spotlight on the table, but when I took my first sip, I was amazed! The secret? Tea bags, shoved right into those bottles en route to the party, and voila – its ready to go. Since then we’ve learned a few tricks: if you need the on-the-go punch, do yourself a favour and pour out half a cup of GingerAle BEFORE putting the teabags in – you’ll need it. 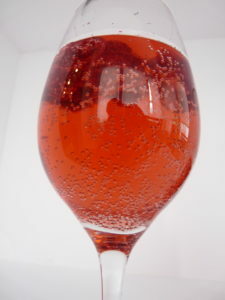 Also – it’s a beautiful, rosy-coloured punch. It’s wasting away in those ugly green bottles! 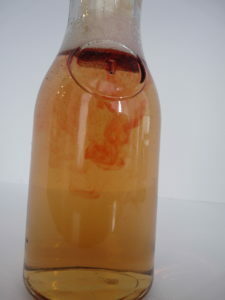 Let people ooh and aah over this punch in a clear carafe or punch bowl – just make sure it’s something that can breathe. 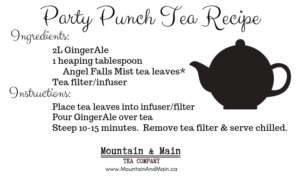 For this recipe, we used our favourite Angel Falls Mist tea – it’s got a lovely floral flavour following the strawberry & lemon notes, and it makes the GingerAle turn a beautiful blush colour. But this punch recipe works with any fruit-flavoured herbal tea, so go for it! It’s super simple: get your tea ready. 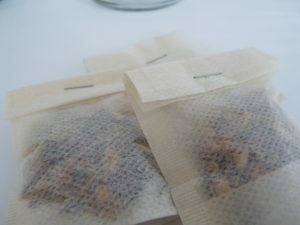 I put about 1 tablespoon of loose tea leaves into a disposable filter and staple it shut. You could probably use a normal infuser as well, it’s just that I’m always making this on the go! 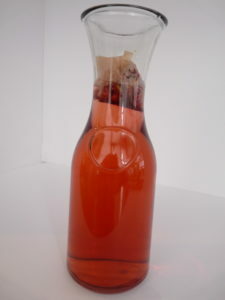 I like just a hint of fruitiness, so if you want it stronger, just add more tea leaves or let it steep longer. I’ve had it steeping up to 30 minutes with good results. 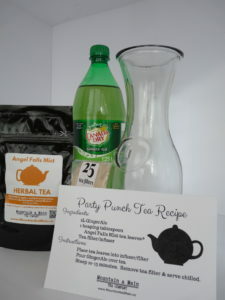 Next – so easy – just pour your GingerAle over the tea and let it steep 10-30 minutes. I love watching the tea blend into the GingerAle – you can see the colours coming together! After 15 minutes, the punch is already looking amazing! Add a little frozen fruit garnish, and it’s ready to serve. So give it a try – it’s guaranteed the easiest punch you’ll ever make! Grab the printable recipe card here.